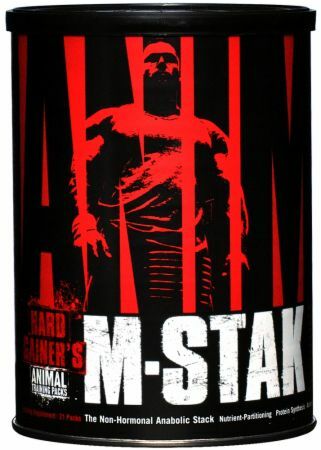 Animal M-Stak by Universal Nutrition at Bodybuilding.com - Lowest Price on Animal M-Stak! Aids with nutrient partitioning eficiency. My husband took this years ago and had me try it for this years fitness challenge. Very comprehensive pack. I felt stronger and did recover faster. I also did the cuts & Animal Whey. Very pleased. Quando comecei a tomar esse suplemento sinceramente não achei que seria tão bom assim. Mas eu estava enganado. O produto é ótimo, acima da média e o melhor de tudo, 100% natural. Great product,at age 50 I notice lots of improvement,just finishes with 21 day cycle,can't wait to start my 2nd cycle. I’ve used this product several times and can’t argue with the results. Could be placebo, science, or the caffeine but I will continue to use this product interspersed throughout my training cycles. Animal rules. Finished my first 21 day cycle. I've felt absolutely great. My diet intake has increased but keeping it as clean as possible! As a vegetarian it's a challenge to maintain your protein intake. My trainer is very pleased with my results. Last evening, in the locker room one of the boys complemented me by saying that looks like you're on steroids buddy! My bench press, squat and deadlift have gone up by 30-40% My muscle mass has increased by 3 lbs. 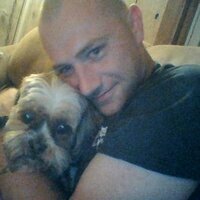 Starting my second cycle on 28 November. Will be keeping a log! Looking forward to sharing it. On my second container now, does what it claims to do. 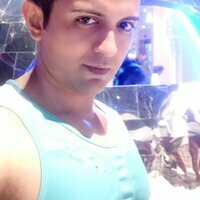 I have lost fat and gained muscle, mostly in my shoulders, arms and traps. Fat loss on my belly. Stamina has improved. 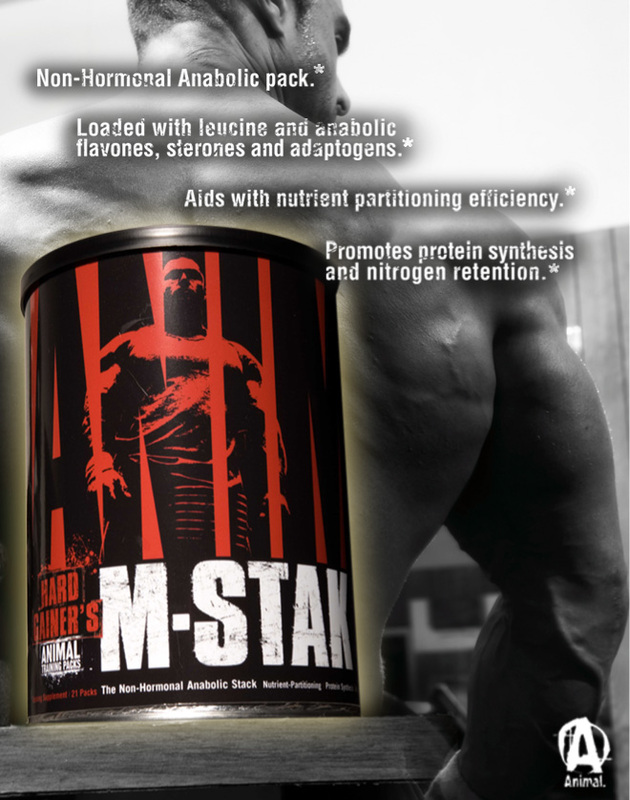 I think M-Stak is most effective for those just starting with lifting. Simultaneously, I think that those just starting should avoid supplements until they get their lifts and diets on track. Most would be better off just choosing a Amino product, as Methoxy and Sitosterol have little evidence supporting they do work and a reasonable amount of evidence supporting that they don't work at all. Finally, it is rather pricey for a one month serving. I saw/felt no difference in anything at all. I think if this works for some people, it is likely just placebo effect. A very powerful product. Recommended for heavy lifters. I used it 7 years ago and it maintained its consistency. That would be the perfect product for the hard gainers. you just need to stack it with creatine and preferably with L-arganine and you will see amazing results no doubts. 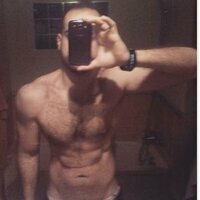 I cycled M-Stak twice over 2 months and noticed great gains. I think it's all about creating the perfect storm just before using this product to allow it to enhance anabolism. I came off a well rested period (1 week) and then hammered out a heavy training routine while on M-Stak. Stick to your diet (eat enough!) and you will make some serious gains. Warnings: This product contains an extremely powerful flavone and phytoecdysterone complex which may greatly boost performance and muscle size. Please consult your physician before using this product. Not for use by pregnant or nursing women. If you are under a physicians care for any reason, please consult your physician prior to use. Reduce or discontinue use if nervousness, tremors, sleeplessness, loss of appetite or nausea occur. Not for use by persons under 18. KEEP OUT OF REACH OF CHILDREN.